High-volume printing performance in a network department printer. Powerful 350 MHz processor for optimal performance; Fast 45 ppm printing (letter and A4) coupled with a <7 sec. TTFP means jobs get printed fast with little or no wait time for users; Standard 32MB to 64MB RAM expandable to 386MB with optional hard drive upgrade handles the largest of jobs. Standard offset stacking allows basic separation of print jobs; MFP option provides advanced copying, scanning, and faxing functions with printer reliability; Direct Web printing with ImageQuick solution. 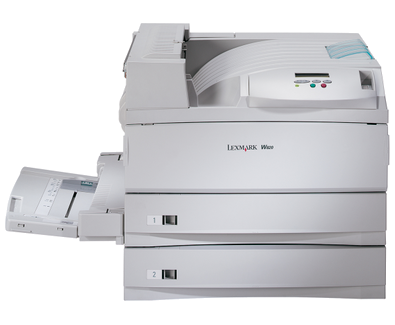 Supports a variety of media types and sizes; from envelopes to transparencies and up to A3 format; Duplex, high capacity input option, finisher option and envelope feeder handle most any document input and output need; Broad scope of Lexmark solutions available for business needs.